Sydney Shop Girl: Lovin' Life 6/12/018: Christmas in the City. 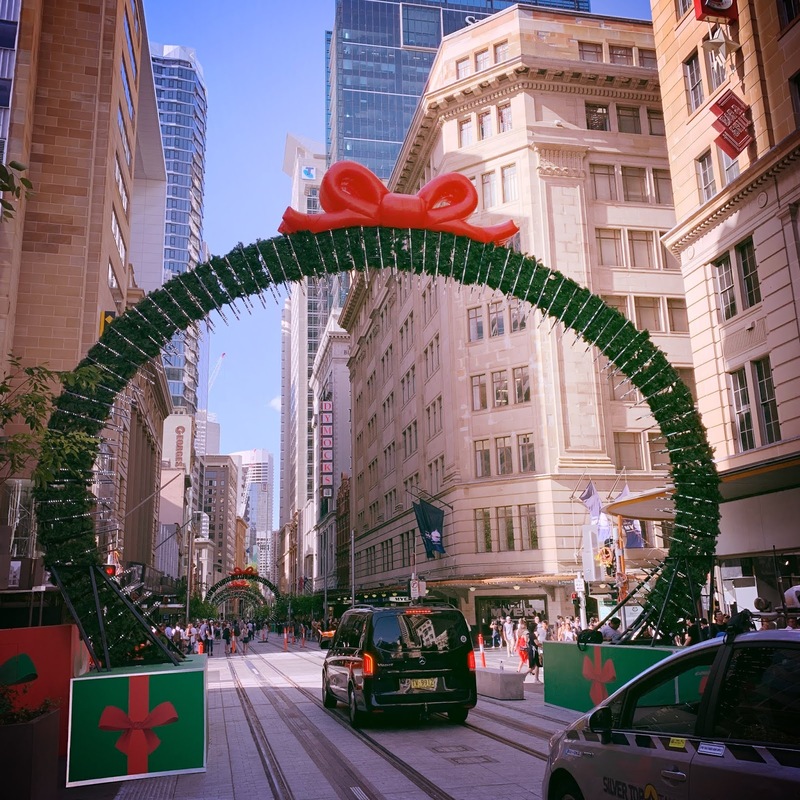 Christmas transforms the CBD. It's still crowded and stop-start as a pedestrian but there's a little something in the air come December that seems to soften its heart and add some sparkle to its eyes. Town Hall Station was festooned with green and red lights. I was too busy keeping up with my little Santa to take a picture of them. The light rail is still a work in progress but that didn't prevent it from getting dressed up for the silly season. 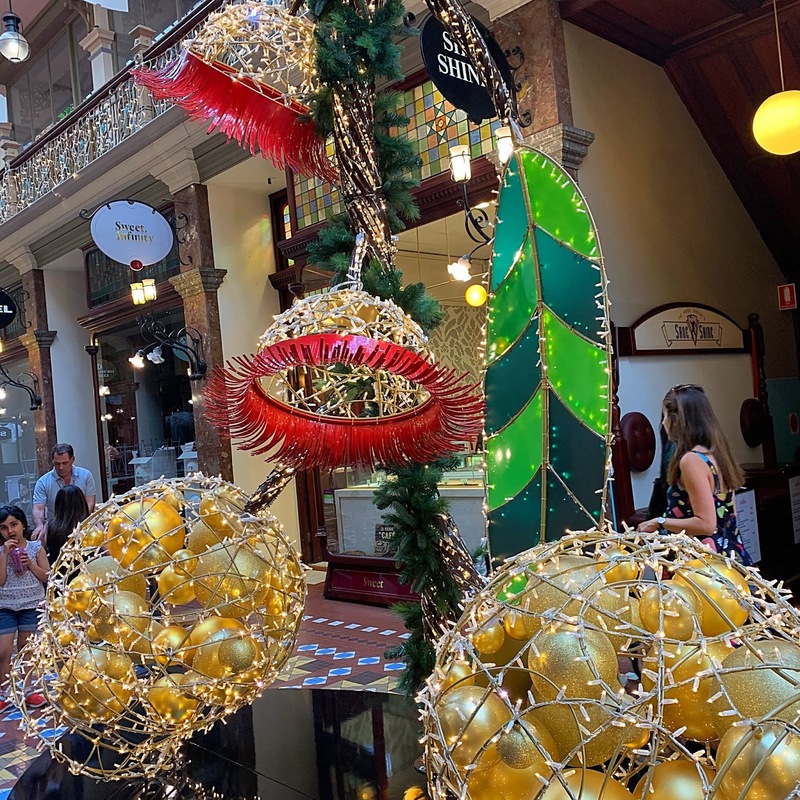 The Strand embraced a Festive Australiana look with giant, glittering gum nuts and gum leaves on display on the ground floor and also suspended from the roof. Cheeky cockatoos perused the Christmas gift range at Westfield Sydney a few blocks down. 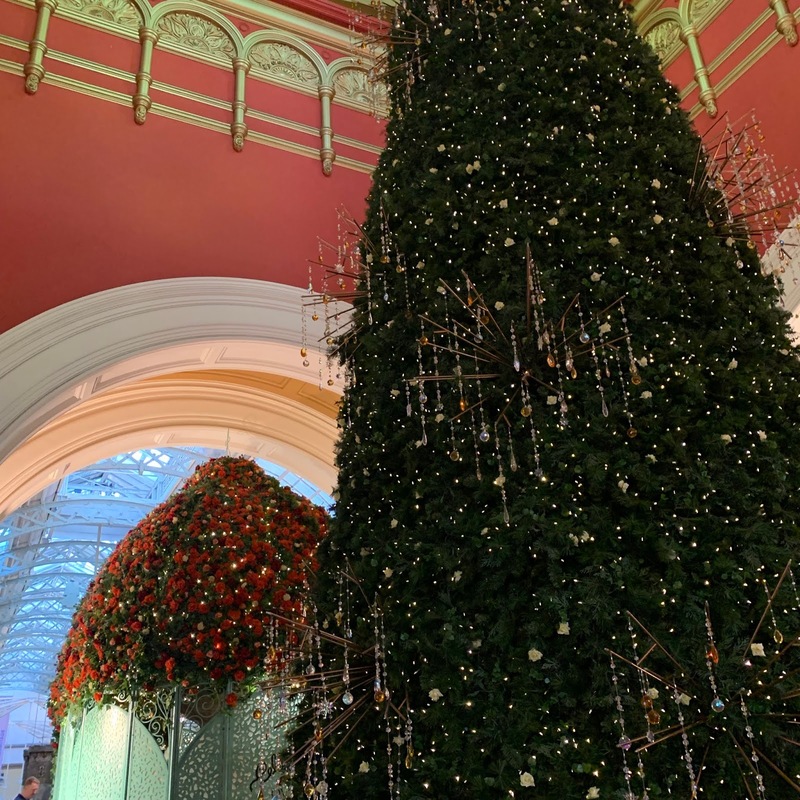 I can never do justice to the tree and rose covered gazebo that are the timeless focus of Christmas at the QVB. Though at least you can get some idea of the hundreds of shimmering crystals that twinkle up and down the tree. Master SSG had his annual chat with Santa inside the gazebo. He was a natural this year and we have a lovely photo that's been sent out with Christmas cards to the family. It wouldn't be a Christmas weekend in the city without suddenly needing dinner only to find that all the food courts close at 5pm. That's my excuse for going to McDonalds at least. Master SSG and I both had a cup of orange juice and I was instantly taken back to my weird pregnancy diet days where McDonalds OJ was the only drink that seemed to get rid of the metallic taste in my mouth so I drank it religiously. It doesn't quite taste the same as it did back in the day. It's more like cordial these days. I know this isn't a pretty photograph but I have just discovered Maccas Loaded Fries. They're basically French fries topped with fast food gravy. They are so, so good and I am glad that they're a regular menu item. 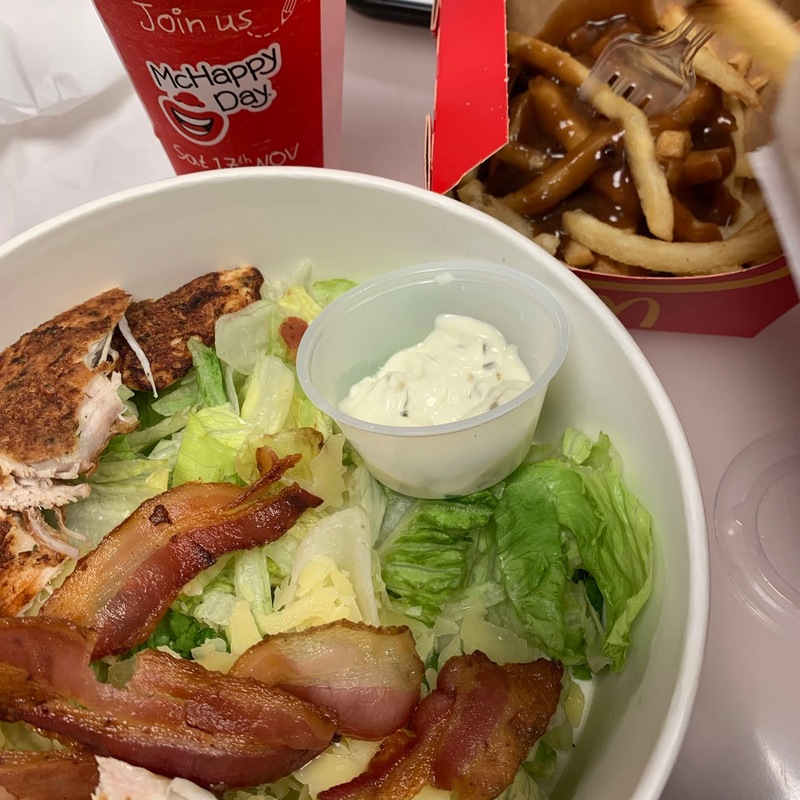 I think these fries and an OJ will be the meal to get me through all the shopping trips I still have to do this Christmas. I feel so underprepared this year. Good tip on the Strand. i never pop in there for the xmas tour. Def will! 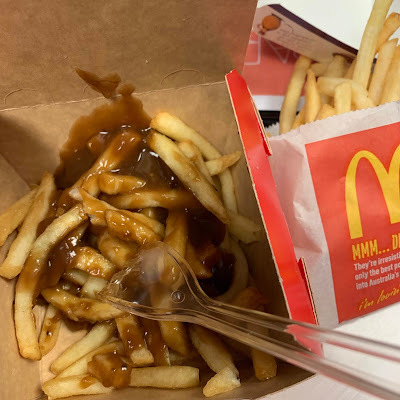 Oh my god, I love fries / chips with gravy. Of course being coeliac makes it hard now cos chips / gravy aren't always gluten-free. Isn't it pretty with all the fun decorations?? I always think it's perfect for this time of year since the days can be so dreary!! 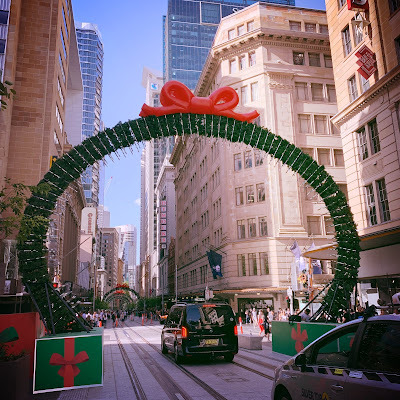 I love seeing the Christmas decorations in the city! :) And it's good you got a nice Santa photo - our one was the best of a bad bunch, ha! I felt a little silly including it in our Christmas cards, but it is tradition now, haha!